In the new WFH economy, working from home isn’t always the most productive option. With offices that often double as kitchens, distractions are abundant, and working can easily devolve into catching up on “Law and Order” while making hot chocolate. Working among others can help keep you in a more productive mindset — even if you’re a one-person team. Hence the appeal of co-working spaces, out-of-home offices where the self-employed can rub shoulders, collaborate, and break up their days by socializing instead of turning to the TV. How do you find the co-working space that’s right for you? 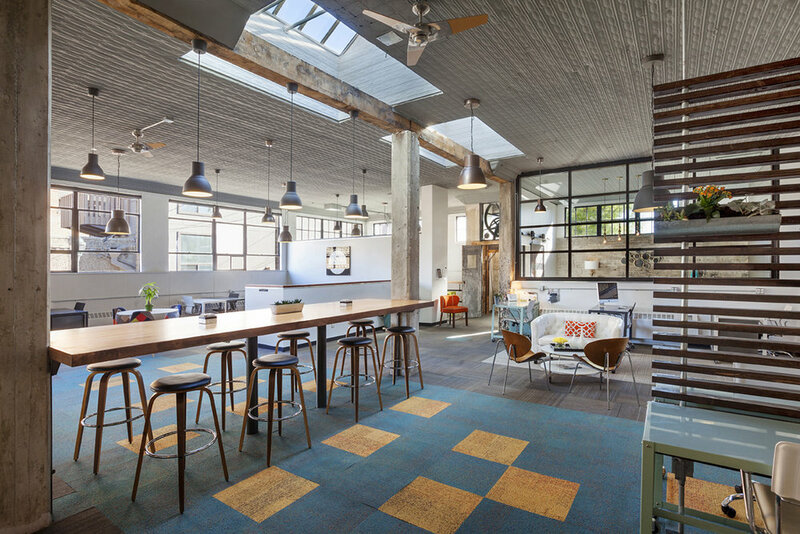 Here’s a rundown of some of the more interesting co-working spaces this country has to offer. From community bicycles to unexpected beverages on tap, here’s what you can expect when you get up from your kitchen table and into a co-working space. Very few people can say, “Today in my office, I played mini golf under the stars, did some yoga, and meditated in the wellness room.” If you pay for a desk at WeWork Mumbai, you’re one of those few people. Along with the usual WeWork perks (speedy internet, free printing, and fruit water), the unique accommodations of Mumbai’s BKC office make it a true palace among WeWorks. Besides the mouthwash in the bathrooms (seriously, what a thoughtful touch), WeWork’s best asset may just be its popularity. With the diverse professional traffic that flows through any given WeWork, you’re bound to meet someone who either shares your passion or has a complimentary skill set that you can work with. You may even pick up a few clients due to the co-working space’s many networking events. Speaking of networking events, WeWork also just purchased Meetup, a platform for organizing group events based on people’s hobbies and interests, as well as the Flatiron School, a platform that provides coding classes (both digital and physical) to developers with all levels of experience. This means WeWork members can mingle with Meetup members in the former’s offices and gain easier access to coding courses. 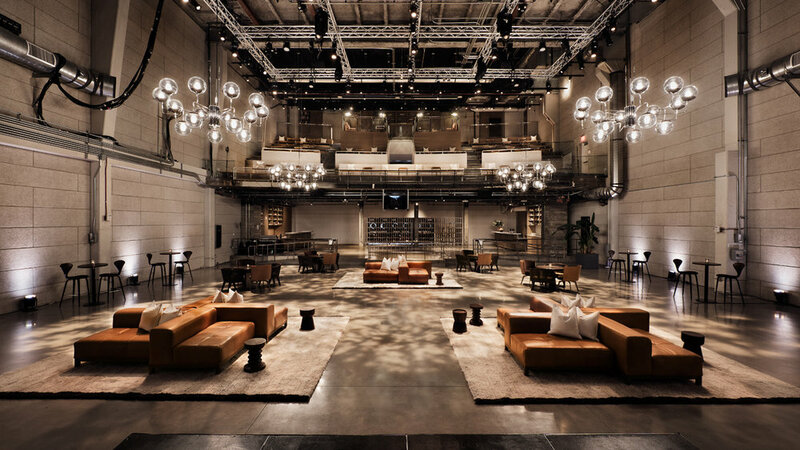 According to WeWork’s website, the Torre Bellini space is one of the company’s “largest locations in the world.” It has to be in order to fit a DJ cabin, a meditation room, a “multi-level mezzanine lounge,” a ping pong table, and a rooftop grill, not to mention the numerous private desks available for individual freelancers and businesses alike. Events here include trivia nights and finance seminars for startups, and your dog can hang out with you there through it all. Located in Hollywood, it’s no surprise that this co-working space has special facilities for performers and filmmakers. Open seven days a week (with shortened hours during the weekend), NeueHouse Hollywood features a broadcasting studio, screening room, “listening room” (like a screening room but for music), and even a performance space. Another unique aspect, NeueHouse offers a “Noir” membership for night owls. For $150/month, these members can get into the office’s communal spaces during only evenings (after 5pm) and weekends. At the most expensive end, private work areas cost $3,500/month and usually accommodate small businesses. Lackluster name aside, Proximity Space offers some intriguing virtual features. You can unlock your office’s door from afar by phone, making for a secure but easily accessible 24/7 workspace. You can also establish a group (say you work with a few others), co-manage your workspace online, and even track the comings and goings of your business’s members. Though Proximity Space launched in Colorado, it now offers spaces across the country, in Florida, Georgia, California, and more. Ultimately, this co-working option seems to emphasize fluid employment and travel. You can purchase a flexible membership that costs $19 per day you decide to drop in, and you can work from Proximity Spaces that are not in each other’s proximity at all. For all you Alaskans out there, The Boardroom is situated in downtown Anchorage and hosts both large businesses and solo freelancers. This offers a serious advantage for freelancers looking to pick up extra work — you’ll be surrounded by businesses that may be looking for your particular expertise. A business that opts for a co-working office might just have done so to find freelancers to begin with. This co-working space also offers office supplies — a big deal if you’re the kind of person who manages to constantly misplace essential items like pens and chargers — and on-site storage, in case your work requires hefty equipment. The coolest perk? The presence of small startup accelerators and small business investors. Students and nonprofits get discounts, and 24-hour access costs $225/month. These three words you probably never expected to hear together sum up the perks of The Urban Hive: Kombucha on tap. But seriously, this Sacramento space embodies the California mindset, complete with free massages (!! ), meditation, and Taco Tuesdays. Healthy “and unhealthy” snacks, including regularly available milk and cookies, round out the co-working experience. Perhaps more targeted towards creatives than other spaces on this list, The Urban Hive has both décor and membership packages to match its clientele. The “Nomad 100,” for instance, gets 100 hours of co-working time per month for $199. A co-working space for women that looks like it was designed by someone who only shops at Pottery Barn, Hera Hub advertises a “spa-like environment” in its several locations across California, Washington DC, Arizona, and even Sweden. This means that each co-working space comes with “tranquil” water features and lavender-scented candles. Overall, the point of this co-working space is to bring together female entrepreneurs. It hosts summits that connect female investors with female-owned businesses and promotes networking. Membership prices vary by city. In DC, for example, membership costs range from $89 to $429 monthly. The access to community bicycles makes this co-working space in Rapid City, South Dakota almost Google-esque. But besides this pretty outstanding perk, The Garage is quite unlike the search engine giant when it comes to physical design. It’s traded in the notion of a sleek-yet-bland futuristic office space in favor of preserving local history. The Garage used to literally be a garage, when Edgar Morrison opened a car repair shop during the Great Depression. Though it’s been updated since the 1930s, the building is on the state’s Historical Registry and still features some of the original architecture. In accordance with the theme, different membership packages get their names from cars. “The Mini” costs $10/day for flexible, part-time use, while the “Alfa Romero” costs $400/month for a larger group. Yes, you can bring your dog. Yes, you can wear your yoga pants. Yes, there are solar panels on the roof. Are you surprised? Green Spaces is in Denver, after all, home of nature lovers and exercise enthusiasts. 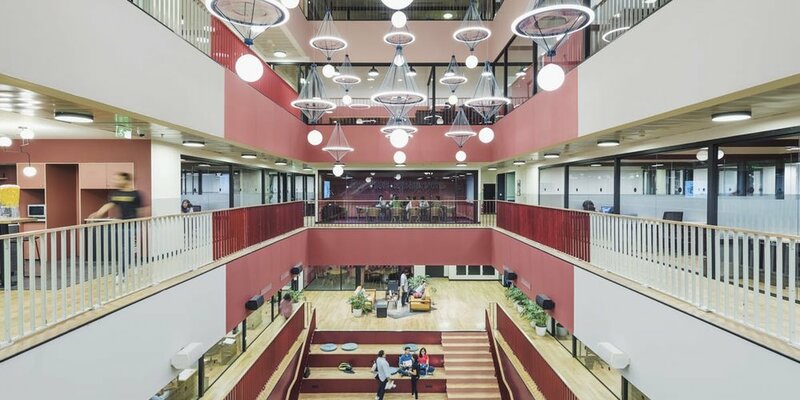 This environmentally friendly co-working space features indoor greenery and wooden cubicles for an outdoorsy vibe aimed at members whose work ranges from outdoor lifestyle photography to healthcare energy efficiency. A “dedicated desk” costs between $250 and $495/month. 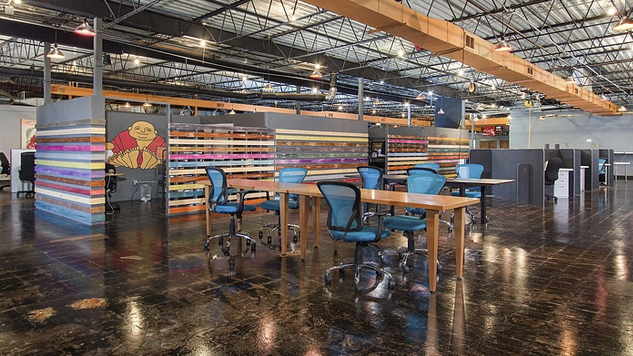 With eclectic décor and a decidedly millennial vibe, Strongbox West in Atlanta, Georgia offers a $95/month membership for those who want to dip their feet into the shallow end of co-working. The membership includes free admission to the space’s events, so you can network without fully committing to an out-of-home desk. Meanwhile, an open floor plan and pool table don’t really make it feel like you’re committing to a desk, anyway. This Manhattan-based space makes the list mostly because it’s a Missouri transplant. Specifically, the creators took apart an old barn in Missouri, brought it to Soho, and reassembled it to accommodate catered events and freelancers alike. At $350/month for a dedicated desk, The Farm costs more than, say, a WeWork membership, but it has twice the personality.